I’ve been using telescopes for 30 years. In that time, I’ve learned a thing or two about how they work. 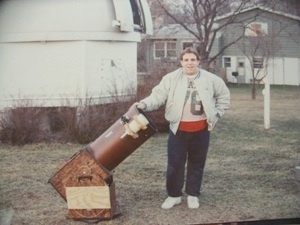 That’s me as a high school student with my old Coulter 10.1” f/4.5 Dobsonian — the first company to sell Dobsonians commercially (mine was 1985 vintage). It’s a far cry from the 22” and 11” Starmaster Dobsonians I use today, but sometimes I wish I still had the old Coulter with it’s homegrown mods. When people ask about buying their first telescope, I invariably come up with the Orion Spaceprobe 3 Altazimuth Reflector Telescope. It’s the only telescope I recommend (just) under $100. It’s great for kids or anyone who wants to “test the waters” with a minimum investment. Be forewarned: Telescopes you see in stores — even ones that look like these — are not the same. Even other telescopes at Orion in this price range don’t equal the performance of this little gem. I’ve tried almost all of them. The Orion Skyquest XT 4.5 is a big step up in optics and stability. It’s more than double the cost of the Spaceprobe 3, however. Our friend Hesther loves hers (it’s called “Big Shooter”) and has observed more than half the Messier list with it. 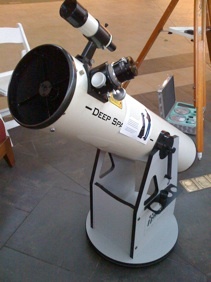 For public outreach, and for quick winter observing sessions in my driveway, an 8” Dobsonian can’t be beat. This old Hardin is out of production, but Orion carries a few varieties. Classic Dobsonians are completely manual, but versions are available that have computers to help you find objects, telling you where to push the scope or even moving it there on it’s own. No matter how automated you get, all 8” Dobsonians provide great views of celestial objects on a rock-solid mount. 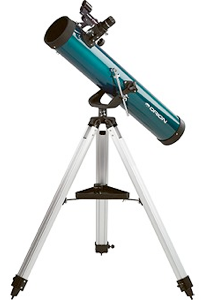 Prices range from about $330 for the basic model to $850 for one with full “go-to” motorized tracking provide great views of celestial objects on a rock-solid mount. Prices range from about $330 for the basic model to $850 for one with full “go-to” motorized tracking. 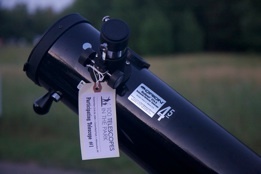 An additional possibility with these simple alt-azimuth (up/down, left/right) -mounted telescopes is to add your own computerized locating system. If you have a smartphone or PDA like a Palm or iPod Touch, you can get astronomy software that will tell you in realtime the current altitude and azimuth (heading) of any celestial object. That means with about $10 of home-made protractor circles and a (now $40) digital level, you can add “push-to” capability to any Dobsonian telescope. These are telescopes I find particularly helpful for beginners, as well as people who want a no-hassle scope they or their kids can set up at a moment’s notice. There are a lot of other telescopes out there, and they all have their uses and charms. 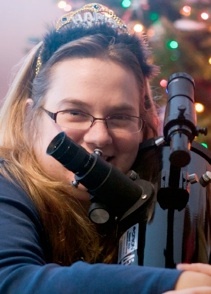 You’ll find a blog a lot about telescopes, so there will always be more to read.